We normally meet at Our Lady of Mount Carmel Roman Catholic Church in Hamden, Connecticut on the Third Monday of the month at 7:30PM. Occasionally we meet at another location. Please check our calendar for the latest Assembly meeting place. All Sir Knights possessing a valid membership card are invited to attend. The Fourth Degree is the highest degree of the order. It is an extension of the third degree. Members of this degree are addressed as “Sir Knight”. The primary purpose of the Fourth Degree is to foster the spirit of patriotism and to encourage active Catholic citizenship. 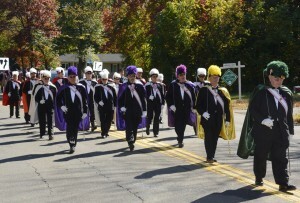 Only Fourth Degree Knights may optionally join the Knights of Columbus’ prestigious Color Corps. The most visible arm of the Knights, as they are often seen in parades and other local events wearing their colorful regalia. The need for a patriotic degree was first considered in 1886, and a special plea was made at the National Meeting of 1899. The first Fourth Degree exemplification followed in 1900 with 1,100 Knights participating at the Lenox Lyceum in New York City. Today there are more than 2,500 Assemblies.